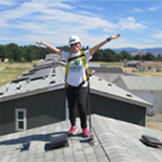 GRID Alternatives Bay Area leads teams of volunteers and job trainees to install solar electric systems for low-income families from Santa Clara to Sonoma County, providing families with needed savings and giving Bay Area workers hands-on experience to help them find jobs in the green-tech economy. Additionally, the North Coast Tribal Satellite Office serves rural and tribal members in Del Norte, Humboldt, Lake, Mendocino, and upper Sonoma counties. Be a part of the clean energy transition- become a client, volunteer or make a donation today!